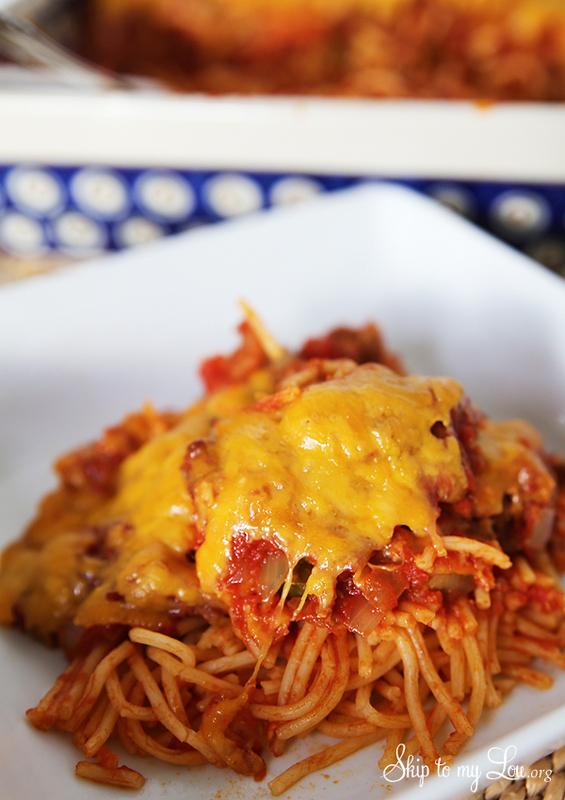 This spaghetti casserole is a delicious dinner that will become one of your regular dinners. A comforting casserole with plenty of melted cheese is the perfect dish for potlucks, family gatherings, or when you want to take a friend a meal. My family loves Italian meals like crock pot lasagna. We also love these easy skillet meals. Typically you will find pasta casseroles are crowd pleasing. 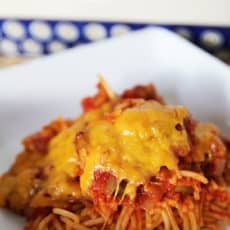 A few variations and jarred sauce and you have spaghetti pie, another family favorite meal. It makes two pies, and can be frozen ahead! It doesn’t get easier than that. Two meals for the work of one. This baked spaghetti recipe can also be frozen. You will love the simple homemade tomato sauce that covers the spaghetti noodles. While it takes time to simmer the tomato sauce it goes together quickly. Use the time to make a beautiful salad. The cheddar cheese tops it off perfectly. A kid pleasing meal for sure. My friend Kim has made it for us many times so I had to have the recipe. If you need something gluten free just use gluten-free noodles and skip the bread. This delicious baked spaghetti will be requested again and again for potlucks and family gatherings. It's especially popular with all that love cheese. Add a tossed salad and garlic bread, and dinner is ready. Brown 1 1/2 pounds ground beef, green pepper and onions in a skillet. Once cooked, drain fat. Mix together 1/2 cup olive oil, cans of tomato paste, cans of tomatoes and drained mushrooms. Simmer for 1 1/2 hours. Once sauce is finished add ground beef mixture. Cook 1 pound spaghetti and drain. Place spaghetti in large 3-quart casserole dish. Place sauce on top of spaghetti and top with grated cheddar cheese. Bake 350 for about 30-40 minutes. Once baked you have a yummy meal! Did you know cooked spaghetti freezes beautifully? This baked spaghetti makes a tone so I can divide have one to serve and one to freeze. For making ahead the only difference in the directions would be to follow all the steps until it says to put it in the oven. At that point, top with foil and freeze. Make sure you choose a freezer safe container. Remove from the freezer the day before you plan on serving so it can defrost in the refrigerator. If you don’t remember to remove it, you can expect your cook time to be about an hour long at least. 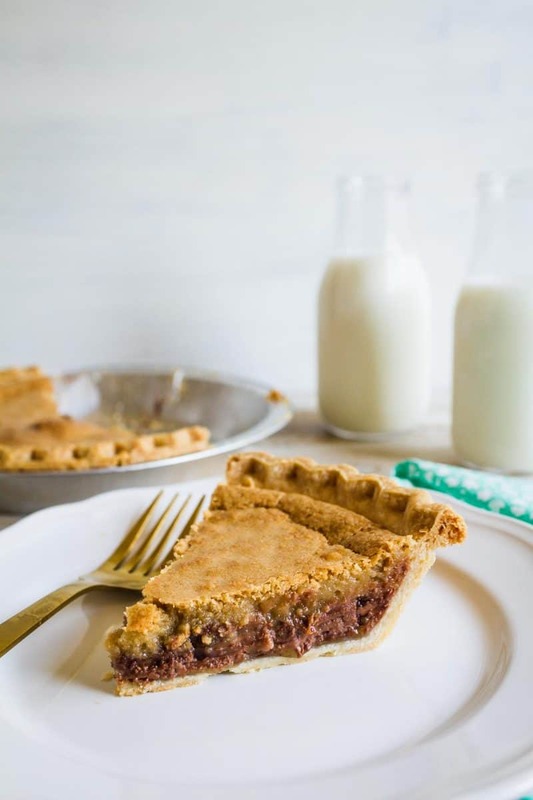 While your spaghetti bakes whip up a Toll House Pie and let it bake while you eat. This would be a great menu for company or to take to a friend in need. If you are looking for more simple dinners I have now been using my Instant Pot for years now. I use it about four times a week. Here are some of our favorite Instant Pot Pasta meals. Let me know what you think of this baked spaghetti casserole! Very yummy recipe! Easy to make and my family loves it!